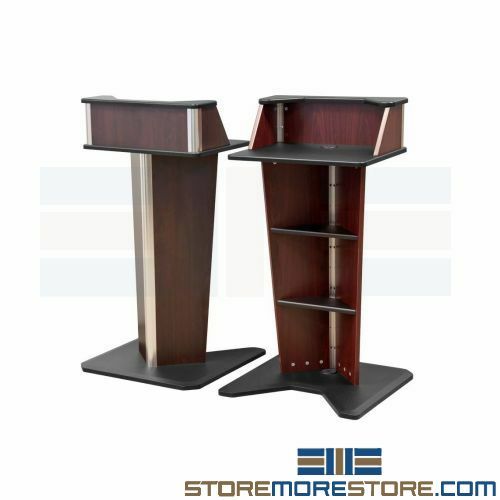 Modern multimedia lecterns and portable speaker podiums are ideal to use as speaker platforms, customer service desks, presentations, conferences, classrooms, and more. With its versatile design, it’s easy to integrate all types of electronics and multimedia equipment according to your needs. Choose from a variety of lectern and podium designs available online. Additionally, most items ship assembled and include a 1-year manufacturer’s limited warranty. The multimedia lecterns and podiums are available with a wide variety of optional features as listed below. Please note that not all of these options are available on every model. Contact us for more information on available options if you wish to include them in your order. 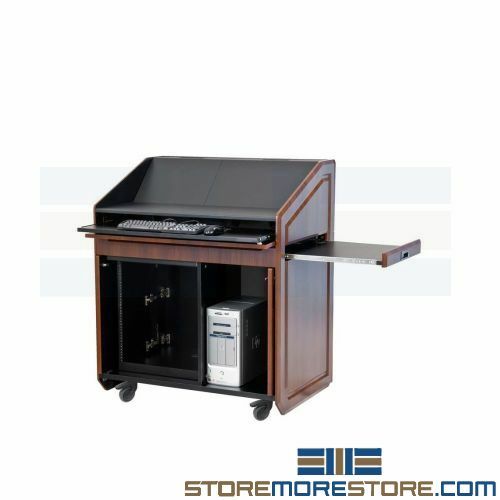 Multimedia lecterns and podiums are available to buy online and ship within 15-20 business days with free dock-to-dock shipping included. If you need any assistance or just want some help picking the right solution for you, please call us at 1-855-786-7667.